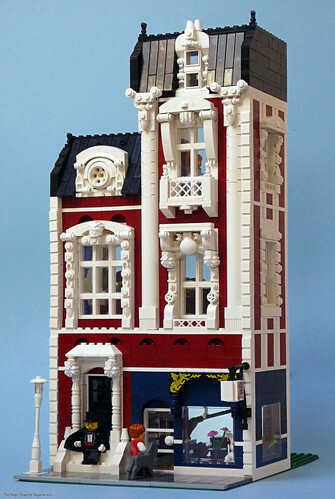 Brick Town Talk: Grand Leguini's House - LEGO Town, Architecture, Building Tips, Inspiration Ideas, and more! Fachada-1, originally uploaded by valgarise. The details on this are just fantastic! The dark red and dark blue clash with the white to form a really imposing structure and the ornate arches surrounding the windows give the sense of wealth and prominence attributed to a mysterious magician such Grand Leguini. We'll have to keep a closer eye on this builder, nice work!